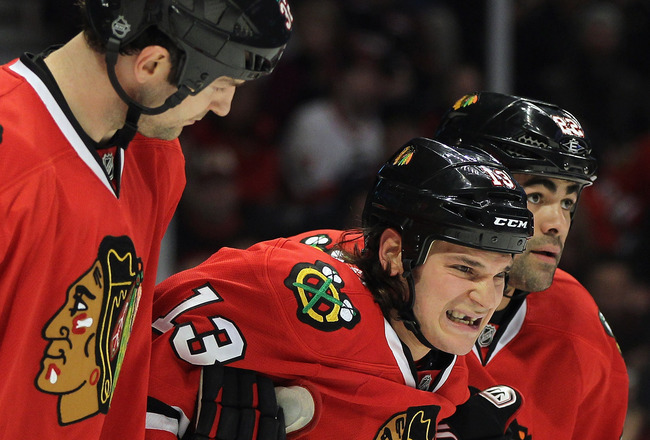 Daniel Carcillo will undergo Anterior Cruciate Ligament reconstructive surgery on his left knee next week. Carcillo injured himself boarding Oilers defenseman Tom Gilbert on January 2nd. A seven game suspension was handed out by Brendan Shanahan on this play. Carcillo’s season is done as the full recovery period for this surgery is approximately six months. Carcillo has had an up and down season. He has gotten suspended and been out with injuries a few times. When healthy, Carcillo played on a line with superstars Patrick Kane and Jonathan Toews. He’s registered two goals and eleven points in twenty-eight games. He’s been playing an enforcing role as well as he’s already accumulated 82 penalty minutes, the 8th most in the league at this point. This is a tough loss for the Blackhawks. When healthy and staying out of trouble, Carcillo has tremendously helped the Blackhawks. Chicago is currently in 1st in the Central Division and only trailing the Vancouver Canucks in the Western Conference. They are ready for another deep playoff run. The loss of Carcillo might force management to make a trade for someone to fill his spot, one they probably wouldn’t have to make if Carcillo wasn’t hurt. This entry was posted in News, Trades, & Signings and tagged Chicago Blackhawks, Daniel Carcillo, Edmonton Oilers, Jonathan Toews, Patrick Kane, Tom Gilbert, Vancouver Canucks. Bookmark the permalink.